Metrolina Landscape can add a touch of ambiance to your property with Landscape Lighting. Our experienced lighting designers work with developers, landscape architects, home owners, community associations and property managers to bring your landscape to life at night. Lighting not only improves the appearance of your property, it increases security during the night hours. If properly illuminated, many aspects of the landscape take on a special beauty at night. 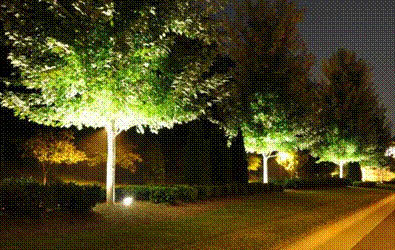 Applications for lighting include: walkways, specimen trees, ponds, driveways, sculpture and architectural features. Our lighting installers utilize long-lasting, professional fixtures, wiring and bulbs. Landscape lighting allows owners and mangers to reap full returns on their landscape investment by enhancing them during nighttime hours. Give Metrolina Landscape a call for design and install of landscape lighting at your home, subdivision, public space or commercial property.